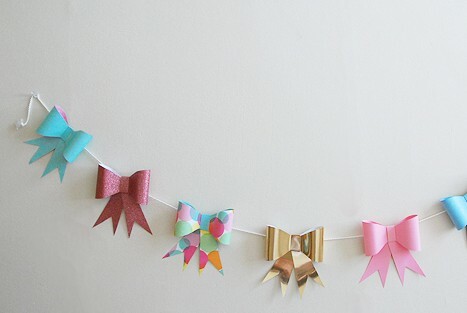 Create bows using scrapbook paper and make a bunting banner out of them! Follow the tutorial on the source to create this idea. See a tutorial for this idea using crepe paper to make the bows and doilies as base. See a tutorial for making flat paper bows. See a tutorial for making paper bows that have horizontal ribbons. See a tutorial for making horizontal crepe paper bows. See a tutorial for making paper bows using toilet paper. See a tutorial for making paper bows out of paper bags.